Sometimes you might have a need to send an email to somebody but you don’t want it to remain on their computer, for security or personal reasons. Unfortunately, it just isn’t possible using the normal emailing system to send an email to somebody and have it auto delete itself after they have read it or after a certain period of time, just think of the kinds of security issues that would bring. Although you can’t do it with your normal emails, there is an alternative which is basically the next best option. That is to use a secure web service where you can leave your message, then you email and send a unique link for the message to the other user and they can visit the webpage and view what’s written. The link and the message both expire after viewing or a set period of time meaning your message never existed. Here we have found a selection of online services that can help you send a secure private message that will self destruct afterwards. It’s not left on a server somewhere, not in another users mail application, can’t be accidentally forwarded and it can’t be read by anyone else apart from who you sent it to. 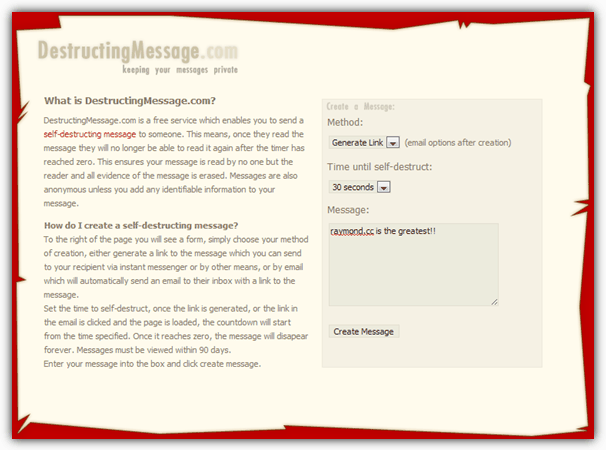 DestructingMessage works using what it calls two different available methods, one is to generate the link to the message directly in your browser, the other is to email the link straight to the recipient. The email address will be asked for after you press the Create Message button. There is also a drop down box allowing you to choose how much time the message stays available for until it self destructs, 15 seconds to 5 minutes can be chosen. A link to the message will become available after you press the Create button which you then give to the other user to view. On viewing the message, a countdown timer will show time left until it reaches zero and deletes itself. Burn Note have just updated their service and now it seems to be more like online chat and you need to create an account to send any messages. The amount of options seems to be restricted compared to the old version too. These include a time to delete in seconds, a password protection option and choosing to display the text to the recipient in either plain text, short phrases which hide after a few seconds until you click on it again and spotlight which highlights only a part of the text under the cursor with a circle. The free Burn Note account can store contacts, send the email for you and also notifies you when a note is read. If you want to send a more visually appealing message than plain text, then Cloakmy could be the one for you because it offers WYSIWYG rich text formatting options for the message similar to posting on the raymond.cc forum. This includes text and color formatting as well as inserting hyperlinks and even images. A switchable code editor is available if you want to use a bit of HTML. As for the message options, you can send straight to an email using the box and include a subject or a security password. The expiration date can be set to auto delete upon receipt of the message, a set date range, or manual deletion only. The link to the message, link to delete the message and the document signature are displayed in the main window. 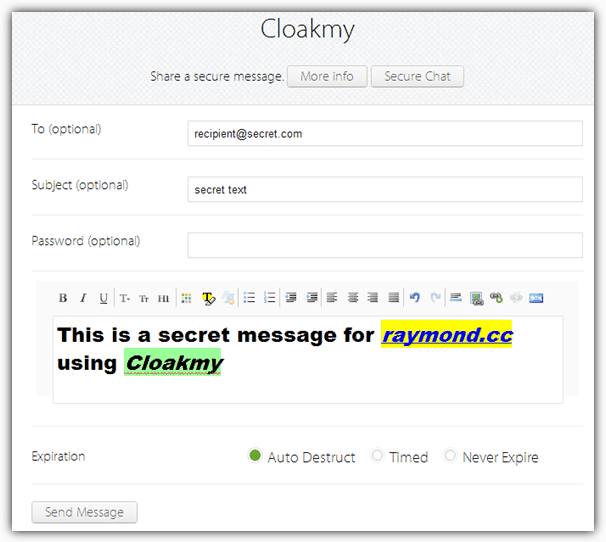 Cloakmy also offers a secure chat room option. PRIVNOTE is not confidential. It is used by LE to acquire personal information such as home addresses that people could use for illegal activity. Another great website like the ones above is SafeNote.co Really would like to see this site included here. As far as I can tell, each one of these are hosted outside the EU. Can anyone suggest a service hosted solely within the EU? temp.cool looks good but I don’t like that it self destructs after a given time, and not after it has been read once. I would suggest yet another one 1time.it. I use temp.cool for this. By far the easiest of all of the similar services I’ve seen. Not a bad selection. It is, however, essential that any such service should also be encrypted and sent only using PGP or similar encrypted email services. HUSHMAIL AND CYBER-RIGHTS, SAFE-MAIL.NET ARE NO LONGER SECURE. WHEREAS AT ONE TIME THE LAW ENFORCEMENT AGENCIES REQUIRED A CANADIAN (OR IRISH IN CASE OF CR) COURT ORDER FOR EVERY MAIL THEY WISHED TO SEE, NOW IT IS AUTOMATICALLY GIVEN PERMISSION TO ACCESS THE ENTIRE SERVER. Body of email text shouod be written in a privnote or other encrypted and self destructing service and never written in plain text that can be read without a password or note URL for browser. Also make sure that the service you use does NOT keep any record of the message at the server, which would undo all the good work! If you are looking for an alternative one-time notes software/web app, take a look the “One-Time Secret Notes”. It is a free tool developed by “Intuitive Password” (an Online Password Manager company) that is used for sharing sensitive information securely and temporarily. The tool is 100% free of charge, its secure and easy to use. All your sensitive information stored with One-Time Secret Notes persists for a single viewing, which means it can’t be read by someone else later. One-Time Secret Notes will delete your message immediately after it has been read. To find this tool, just googling “Intuitive Password”, then go to their home page and click on “Free Tools” on the top menu, then select “One-Time Secret Notes”. TEMPNOTE.COM DOMAIN NAME HAS EXPIRED AND IS FOR SALE AS OF APRIL 7TH, 2017. AWESOME!! I just tried CLOAKMY and it was exactly what I have been searching for for a long time!! Much Appreciate your research and sharing!! Lovin’ CLOAKMY THANKS!!!!!!!!!!!!!!!!!!! Thank You very much for the useful articles.